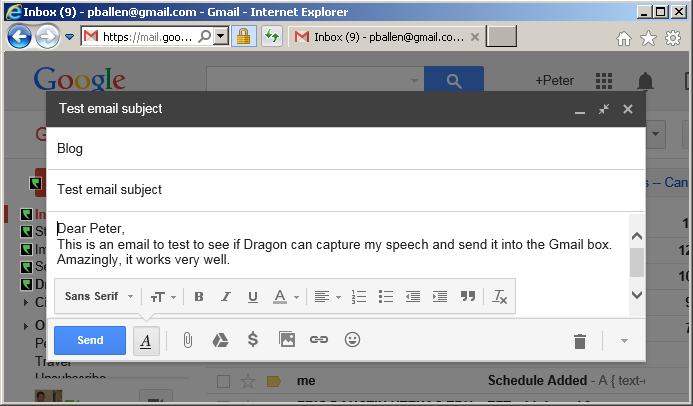 Dragon Naturally Speaking can capture speech into the Gmail text box. It works very well, but only in Internet Explorer. Chrome and Firefox used to always go through the Dragon Dictation Box, which is clunky. That seems to be getting better with later versions but IE is still behaves more how I expect. One advantage of using the gmail compose box instead of wordpress for blogging is that I can insert images into the email body and then they publish seamlessly to WordPress. I like that a lot better than the wordpress insert image process (which doesn’t paste directly from the clipboard, alas). I use a program called Greenshot to take pictures of things on my screen. It’s nice because you can drag-and-drop a particular section of your screen and copy it to the clipboard (there many other options for software that can do this). What this means is that you can arrange your screen the way you want, copy it, paste it into an email, and send that email as a blog post (like I did above). And you can do that all with Dragon integration to speed up the actual writing process. Dragon works for google docs, too, though there are some bugs. You have to watch it pretty closely to be sure it does not introduce spaces and incorrect capitalization. In word, those things ‘just work’ for the most part. This entry was posted in Uncategorized on November 20, 2014 by Peter.